Q: When I visit my URL’s /z shortcut, it’s pointing to the wrong session. How do I get it to point to the session I want? A: Did you know you can share a session-specific URL or QR code with your audience? To learn how to find your session’s shareable link, click here. The /z shortcut default is set up to point to the latest session created, but it can be manually changed to point to a specific session at any time. Once it has been changed to point to a specific session, it remains pointed there until you change it again. 1. Go to Sessions and find your session in the list. Next to the session’s title, there is a small pin button. 2. Click the pin button to point the /z shortcut to this session. It will be highlighted in green to indicate the /z shortcut is pointing to the session. 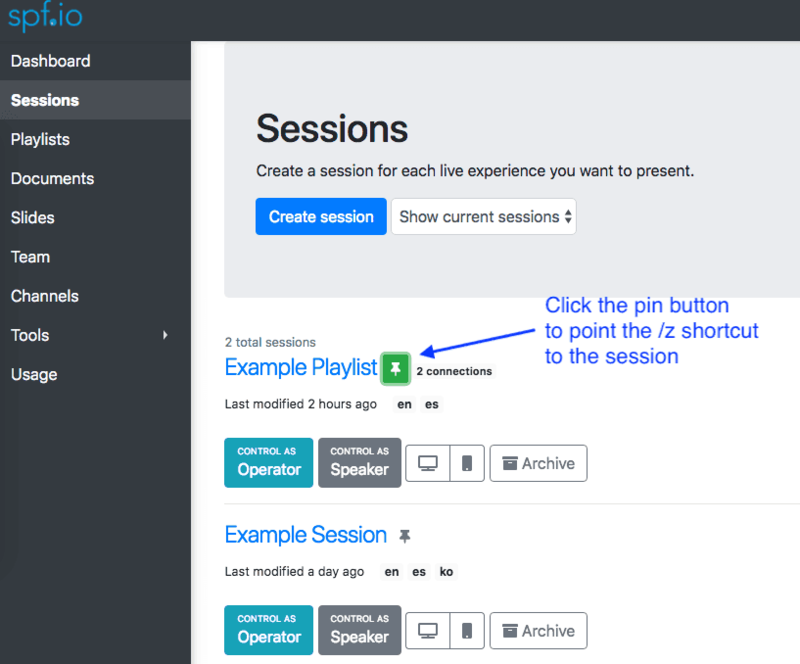 Click the pin button twice to set the /z shortcut to return to the default setting (it will be highlighted in blue) and always point to the latest session created. 3. Visit your URL’s /z shortcut again and confirm it now leads to the session you want.